A few weeks ago I went to visit the lovely Jo at Mill Cottage Soap, to buy supplies for my woolly wash balls. I came away with four different soaps: naked (no scents, just soap), orange and cinnamon (a glorious, rich scent, but not overpowering), mandarin and lemon (a zingy refresher) and bergamot and patchouli (requested by all you old hippies out there!). Jo makes her soaps on a relatively small scale in her kitchen, so it really is a cottage industry. As a result she doesn’t always have all the varieties available, but I was still spoilt for choice. When I visited, some of her soaps were still ‘curing’ in big blocks… two of these were varieties that I was keen to have, so I returned home with slabs cut specially for me that I had to promise not to use for several weeks (not a problem with my busy life). However, the naked soap and the orange and cinnamon were ready for immediate use and so those are the ones I have been experimenting with. By using only the soap that goes in the centre of the wash ball, the whole article becomes permeated with the appropriate scent and is perfect for immediate use. So far, all my trials with Jo’s soap have been with Blue Faced Leicester wool, and both the fibre and the soap are lovely to work with. To aid identification, I am colour coding the wash balls, so orange and cinnamon ones are being embellished with orange and yellow. I didn’t entirely think this through, because I’m not sure what I’m going to use for mandarin and lemon…perhaps yellow and red. Now I just need to sort out my labels and some cellophane packaging and I will be ready to open my etsy shop! 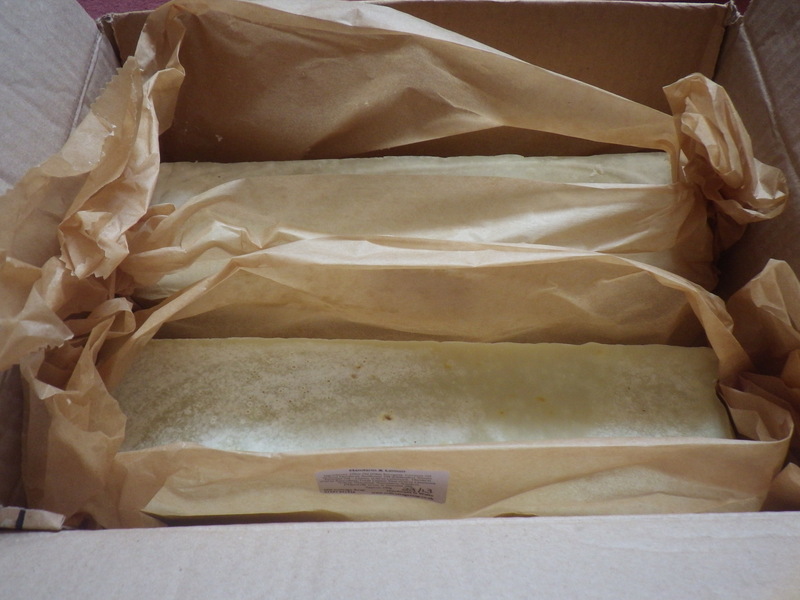 Today I am very excited about soap… I have just spoken to the lovely Jo from Mill Cottage Soap in Llandrindod Wells. 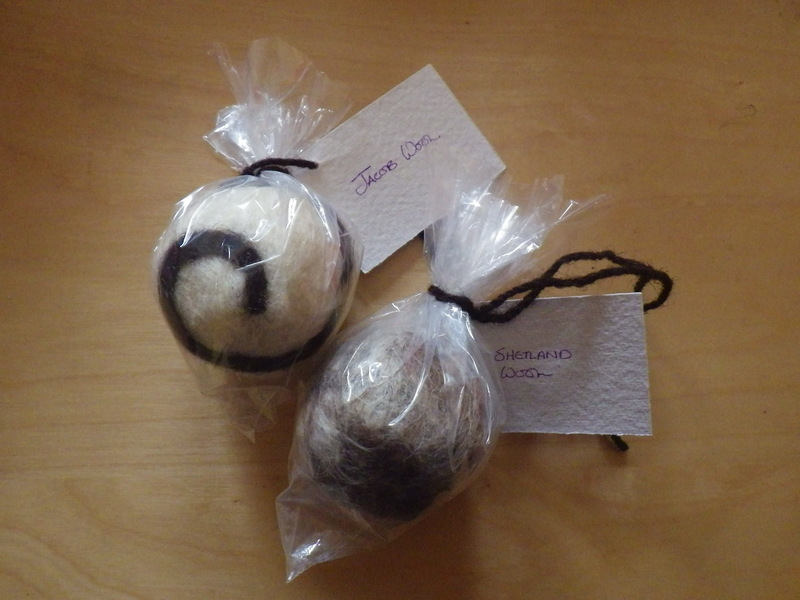 And some small samples will be on their way to me soon so that I can select some soaps to start making wash balls with. I’m really pleased to have found someone in Wales who is producing their soap in a way that’s kind to the environment. I was particularly keen to buy soap that doesn’t have palm oil in it. I know that it is possible to buy ‘sustainable’ palm oil, but there are still concerns about the lack of regulation in this sector and the fact that pristine forest land in Indonesia and Malaysia is being lost to new plantations. However, Jo uses mostly olive oil plus some coconut and sunflower oils. She uses essential oils, such as lavender, geranium and orange to scent the soap and adds no colours. We discussed the relative merits and qualities of soaps made out of different oils and talked about the soap making process and what types of soap are popular and I feel comfortable that I have chosen a good company to buy from. I have written previously about keeping money in the local economy, and using Mill Cottage Soap will allow me to do this too. In addition, I can go over and collect. I travel quite regularly from my home in west Wales to Shropshire and Herefordshire, and Llandrindod is on the way. I will thus be able to save on postage, cut down the packaging and reduce my ‘soap miles’! So, any requests for specific scents? I quite fancy Rosehip and Geranium, but I think Lemon and Lime or Peppermint and Tea Tree both sound very refreshing. And then there’s Bergamot and Patchouli, which sounds quite exotic… so many choices! When I started this business with the bath puffs, I had no idea that it would come to occupy so much of my time and my blog… but that’s life isn’t it: you take a small step and it leads you down a very long path! ‘The road goes ever on and on’ as JRR Tolkien wrote. Early on in my quest for the green bath puff I dismissed sheep’s wool as a fibre because of its propensity to felt. However, over the months I have learned more about wool, its properties and the way it is processed. I’ve also come round to the idea that felt might be a desirable material to wash with for some people (yes – I know some people can’t stand it on their skin, but they do seem to be in the minority). Anyway, in terms of the ethics of knitting/crochet yarns, unless you want to avoid animal products, there is a great deal to recommend wool, especially for those of us who live in the UK where few plant fibres for yarn are produced, but where we have lots of sheep. 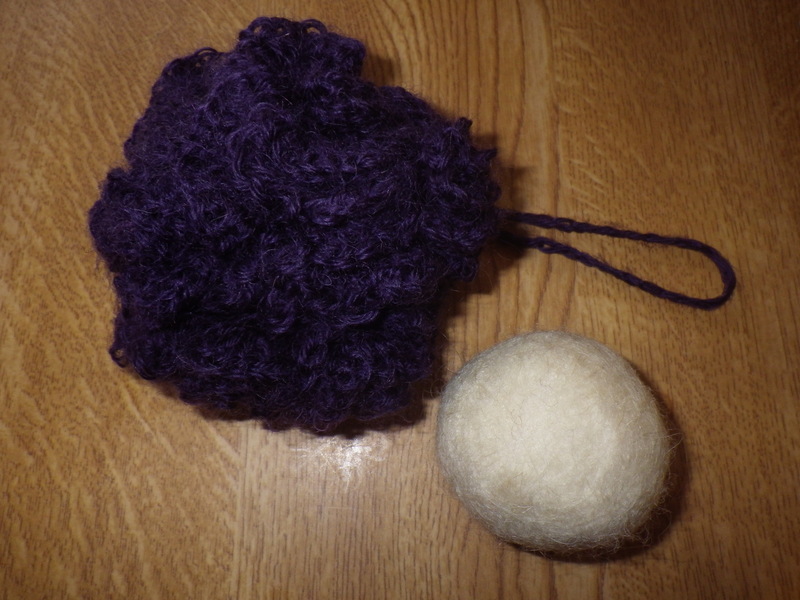 Inspired by the woolly wash balls (I’ve just made one from Jacob sheep wool that’s lovely) I decided to make a wool bath puff. Using some wool that used to be a cardigan* and that I know was sold as being machine-washable, I produced yet another prototype, which I tried out this morning. It was nice to use and produced some lather (although I was using Green People Aloe shower gel, which is very concentrated)… it’s hanging up in the bathroom now to see how long it takes to dry – it can’t be as long as 100% cotton! I suspect that it will felt after a while, but perhaps that doesn’t matter. And, finally, for the time being on bath puffs, I notice the large number of searches arriving here on my site from people who want a pattern for a knitted bath puff (as I did originally). I am guessing that, unlike me, many people are not prepared to put aside their prejudice against knitting and learn to crochet. So, over the next week or two, I’m going to design a knitting pattern… watch this space! * You might also recognise it in the snails at the top of the page. 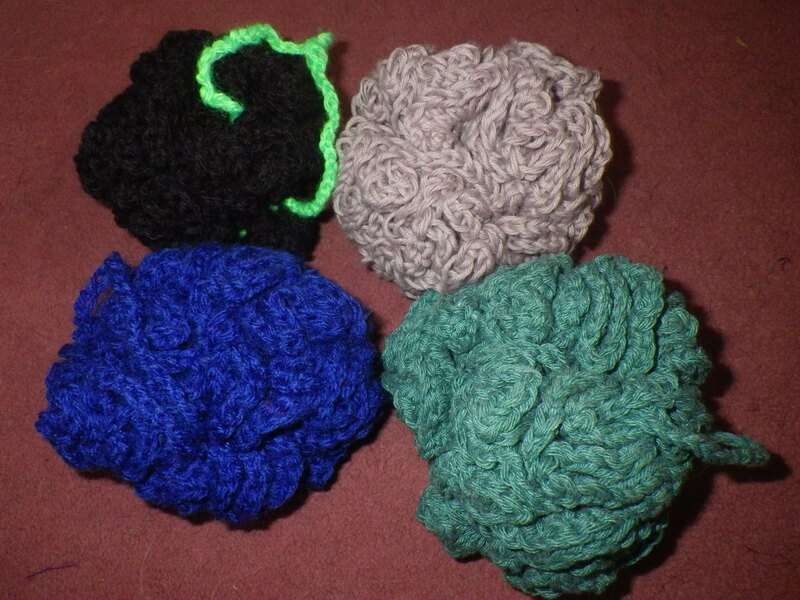 So, after much dithering, I am starting to create stock for my planned shop – mainly bath puffs. I have a variety of yarns to use – recycled cotton and new organic cotton (which will make very soft and absorbent puffs – more like a flannel than a nylon scrubby and ideal for the bath); upcycled acrylic (the closest I can get to the familiar nylon scrubbies and better for the shower); and a range of twines, including hemp, nettle and bamboo. I have come to accept that nylon is nylon and other fibres simply do not have the same characteristics. If you want a nylon bath puff, that is what you will have to buy. But if you want a greener option, then there are a range of fibres with a variety of properties that can easily be turned into a puff. My exploration of bathing products is not finished, however. Thanks to inspiration from my friend Anja (have you checked out her blog Free food for rats?) 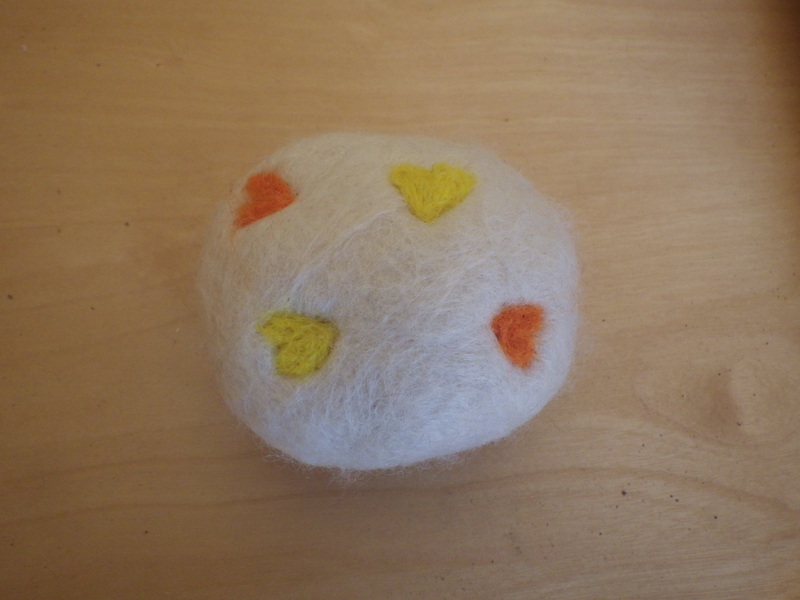 I am now creating what I am calling woolly wash balls – felted bars of soap*. 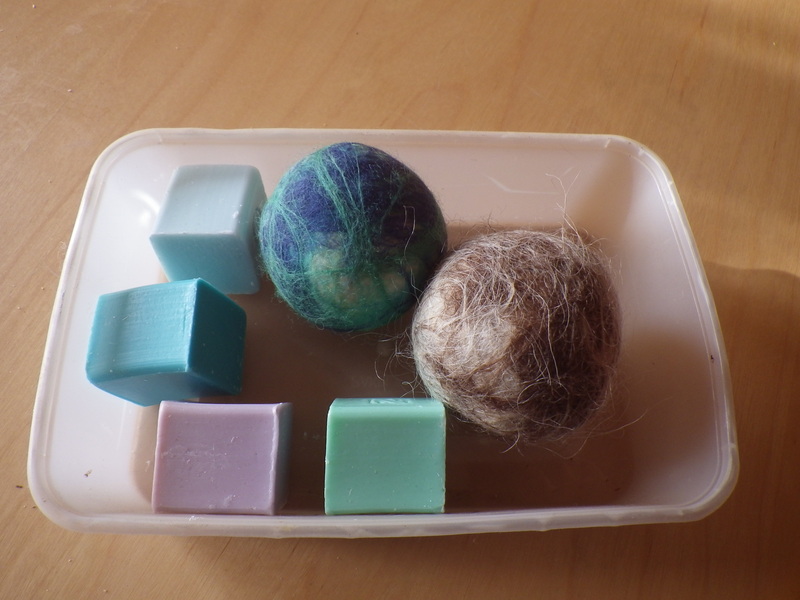 I think that these will work well – they are self-soaping, but once the soap is used up you have a lovely felted scrubby or puff. I’m currently working with soap that was in my store cupboard, but I’m hoping to get hold of some lovely locally made soap. I’m also testing out different wools – I particularly like the idea of undyed wools (like the Shetland in the picture) and have just bought a variety of these to play around with… more on this in a later post.